I had such high hopes for this book. The question of religious freedom versus one’s well-being is so fraught with nuance that there is never an easy answer. When even individuals can be conflicted about where we stand, personally, on certain issues, how much more difficult must it be for law makers and law enforces, who must weigh the needs of a wide range of people. The Children Act is about Fiona, a High Court judge, who must decide on the case of seventeen-year-old Adam’s right to refuse life-saving medical treatment due to religious reasons. As a minor, his parents’ wishes must be taken into account, but in this case, they’re all in agreement that he should be allowed to refuse. The question is, should the court intervene and save his life? Can a seventeen-year-old, who has grown up in a devout household, truly be said to be making an informed choice when he decides on religious belief over his own life? To help her reach a decision, Fiona decides to visit Adam, and her judgement is further complicated by the bond she forms with the boy. Being childless herself, the moral dilemma of allowing a child to die is particularly difficult for her to face. This leads to a third act plot development that just completely ruined the novel for me. Without giving too much away, I’ll say only that it turned the book ordinary. 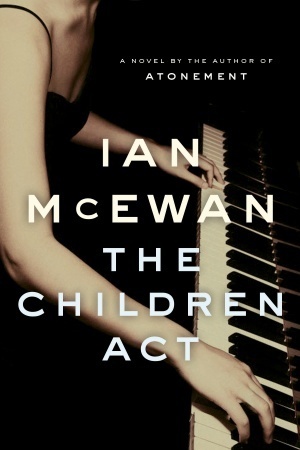 Despite such a promising set-up, with such nuanced ethical quandaries to face, McEwan instead chooses to focus on Fiona’s personal life, which is a valid choice for sure, yet also one that deflates the novel somewhat. The ending returns somewhat to the question of religion and its role, but I still wish the novel had grappled with its themes just a bit more than it did. This entry was posted in Book Reviews and tagged 50BookPledge2014, Fiction, Random House Canada by Jaclyn. Bookmark the permalink.